This animation includes two Lionel horizontal tanks (tank type subject to availability) with illuminated lights. 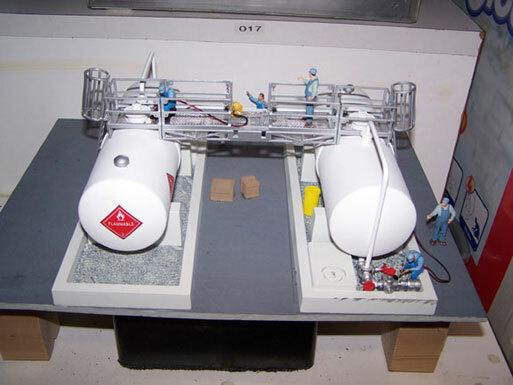 This animation features a welder on the catwalk of one tank and a figure welding the piping on the other. Each welder has a new extremely realistic, electronic, flashing white LED welding arc. Each welder LED flashes independently. Real smoke rises from each "cutting" area. Includes actual random welding sounds. Adjustable volume. Includes smoke and wiring diagram. Fully landscaped as shown.